Multisubunit tethering complexes (MTCs) are a group of conserved protein complexes fundamental to achieve correct vesicular transport: MTCs specifically recognize cargo vesicles and tether them to the appropriate acceptor membrane. Although they all serve a similar purpose, this group of complexes is highly heterogeneous. MTCs exhibit minor sequence homology, come in different sizes and have unique protein compositions (Figure 1). Figure 1. Network of protein-protein interactions among MTCs subunits (STRING database). Besides the core subunits, which are well described (Figure 1), several studies revealed the presence of novel components that associate with MTCs, including an increasing collection of GTPases and kinases that regulate their specificity in transport directionality and cargo recognition (Table 1). Generally, the ephemeral lifetime of regulatory interactions makes their identification difficult, suggesting that more transient components of MTCs might remain to be elucidated. Importantly, a comprehensive analysis of cargo specificity for each MTC is also missing. Table 1. Specific transport directionality for yeast MTCs. We perform a comparative analysis of MTCs using yeast as a model organism. 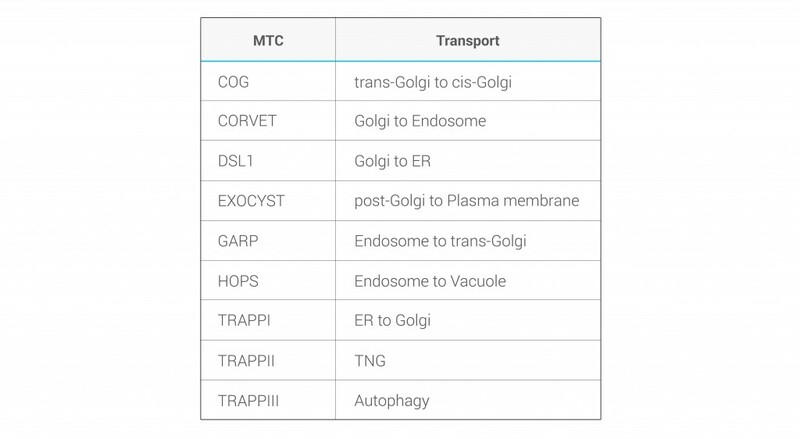 The project aims to identify proteins that associate transiently with MTCs, with a singular interest for regulatory subunits and specific cargo. It also seeks to describe their structure and mechanism of action.